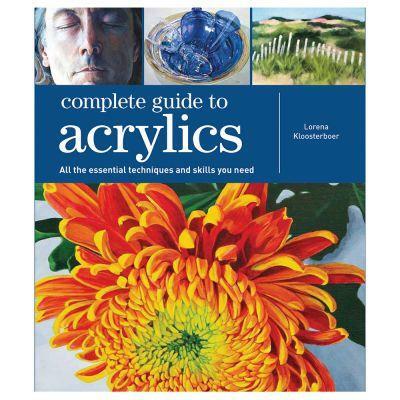 This comprehensive and accessible reference guide provides an in-depth exploration into the art of painting with acrylics, and has been created as one book that will accompany the reader on the complete journey from beginner to artist. With expert advice and step-by-step guidance in a wide range of techniques, this is an indispensable resource for beginning artists, students, and experienced painters alike. Drawing on the expertise of master painters from around the world, Complete Guide to Acrylics covers every aspect of working in acrylics in detail, from materials and mediums to tools and techniques. It is also a very practical approach, brimming with demonstrations to explain and reinforce the essential skills, and offering useful insights into all stages of the creative process. Accompanied by a wealth of images, and with a useful reference section with technical data and notes on commissions, selling and exhibiting, this is the ultimate desktop resource for artists, students, and hobbyists alike. Lorena Kloosterboer (b.1962) is an internationally acclaimed Dutch-Argentine artist, whose award-winning artwork has been exhibited in galleries and museums in numerous countries. Her paintings have been published in leading international art magazines, museum catalogs, and art books. Lorena Kloosterboer currently lives and works in Antwerp, Belgium. Different types of acrylic; Comparison to other paints; Top 10 brands of acrylic paint; How to read a paint label; How to make your own acrylic paints; Mediums & additives; Keeping acrylics workable; Metallic paints; Varnish. Beginner's guide to art supply shopping; Palettes; Set up; Visual tools; Masking; Special effects tools; Brushes Brush shapes; Palette knives & shapers; Different types of canvas; Stretching & mounting; Paper; Art panels; Surface preparation; The artist studio. Colour theory; Different brands, different colours; Choosing colours; Values; What do you want to say; Size and dimensions; How to make a good reference; Order of work; Transferring images. Rules of ethical behaviour; Entering competitions/exhibits; Art community; Consistency in art; Finding a title for your painting; Keeping records; Photographing your work; Framing; Shipping your artwork and reproductions; Social media & tuition.